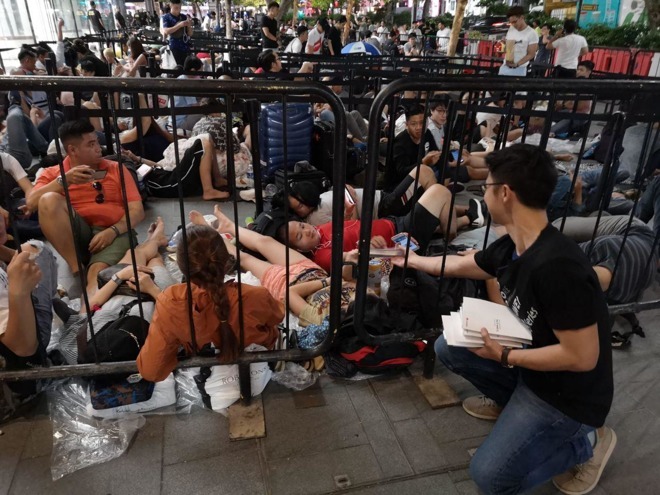 Customers waiting in line to buy the iPhone XS and iPhone XS Max became the subject of a marketing campaign from competitor Huawei, after representatives from the company handed out branded power banks to people camping outside of one Apple Store in Singapore. The subversive marketing stunt saw Huawei gift people in line the portable power supplies, in boxes bearing the message "Here's a power bank. You'll need it." Mothership reports people wearing Huawei shirts were providing the power banks to people in the queue from 11pm on Thursday night, with approximately 200 units given to people outside Apple's flagship Orchard Road outlet. According to the report, the power banks were worth S$80 ($59) each. Huawei's backhanded gifts are an attempt at mocking the iPhone's supposedly small battery life, while also promoting the company's own hardware. While the iPhone XS and the iPhone XS Max have 2,658mAh and 3,174mAh batteries, Huawei's flagship P20 Pro has a larger 4,000mAh battery, though it is worth noting battery capacity does not directly translate to longer battery life due to varying degrees of power usage between devices. The iPhone XS queue antics is the latest attempt by Apple's competitors to try and undermine the launch of a new iPhone via the queues and the customers themselves. The main culprit of such attempts is Samsung, who has a long history of attacking Apple in its marketing. Shortly after the launch of the iPhone X in 2017, Samsung released a commercial called "Growing Up," which poked fun at the iPhone's innovations over its lifetime, as well as at people who stand in line for the newest model. In 2015, Samsung handed out blue cushions and water bottles with the tagline for its latest Galaxy device to people in queues in London, but seemingly with barely any impact. In 2013, a Samsung film crew visited the Fifth Avenue Apple Store in Manhattan to film the lines, but rather than attempt to hawk the company's phones, the crew appeared to be documenting the event, asking questions to attendees about why they were here and probing the loyalty of Apple's fans.